1998 proved to be an exciting and rewarding year!!! Our dogs have done very well, here in the USA and abroad — Group wins, Specialty points and Sweepstakes wins, new champions, promising young puppies to name a few, including a milestone for Paxon. In the show ring, we have the privilege of showing Am/Can Ch. KitEHawk’s Black Tie Affair, “Tetley” for owner Vito Bavaro of Canada. “Tetley” has won over 1/2 dozen Group 1’s, and many other Group placements, finishing as #4 Kerry for 1998, with limited showing. 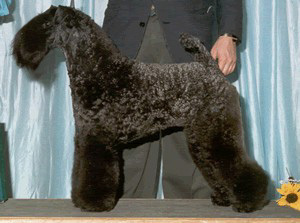 A “STALLION” of a dog that is known for his outstanding showmanship and “FLAWLESS” movement, is also proving to be an outstanding sire. His young son, new Ch. Paxon’s Irish Tenor, “Ajax", became the 50th Paxon champion at the young age of 16 months...a milestone for Paxon. Our other 1998 champions include #51, Ch. Paxon’s Spin to Win, “Grace". A 1999 breeding to "Tetley" is planned. In Finland, New Finnish Ch. 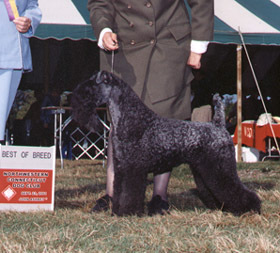 Paxon’s Merry Blue Starlet, "Wendy", owned by Marjukka & Pekka Sarkanen, Merry Blue Kennel. “Wendy” finished her title in short order and is now working in agility and obedience. In Canada, Can. Ch. Paxon’s Wild About You, “Pebbles” enjoyed an exciting climb to her championship by winning a Group from the classes. “Pebbles” has retired to motherhood, producing 7 beautiful puppies sired by “Tetley". For 1999 there are several youngsters that are nearing their titles. 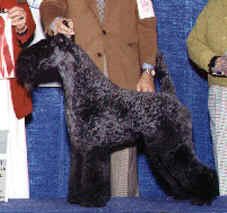 Paxon’s Kylemore BB WBY,“Lucy", a Specialty point, and Sweepstakes winner is just a major away. Also pointed, Paxon’s Jewel of Ireland, “Sapphire", and just 2 single points away is litter sister, Paxon’s Jorkaite Kori, “Kori". Major pointed from the puppy class is Paxon’s Lucky Charm O” Rockwell,“Shamrock”. 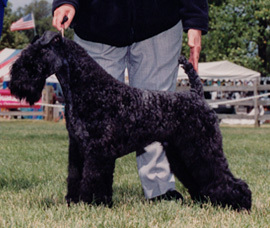 “Shamrock” was the Sweepstakes winner at the National Roving Specialty in the Spring of 1998, and is also a Puppy Group winner. These youngsters are all sired by “Tetley", and should be finished before the end of the year. As we step into the 21st century we look forward to more promising youngsters that are just starting out and others still waiting in the wings.